Deep Space Sparkle Art Lessons for Kids: Kinder Cows! I had a request from one of my kinder teachers to teach a class on drawing animals. Not exactly my forte, but I remembered a cute lesson in the Art Projects for Kids Blog. Kathy created an adorable cow, complete with a graphic on how to draw the little Holstein. Here is Kathy's post. I experimented with the instructions, but with only 30 minutes to draw and paint the cow, I knew my instructions had to be fool proof. I debated whether or not to use a pencil. As you might know, I'm not a fan of pencils for most elementary art projects because it gives the kids a chance to No. 1, draw too small and No. 2, be too perfect. But I knew if the kids drew directly onto the paper with a black crayon, there would be lines where lines shouldn't be (neck and legs). I threw caution to the wind and decided to try both methods. For my first class of kinders, I handed out crayons and proceeded to show them how to draw the cow. I drew it on the white board and used lots of adjectives so they'd remember the steps. Then, I let them go to it. Some kids eliminated steps on their own, thus didn't have the extra lines. (Unfortunately, I didn't take photo's of this step). For the next wave of kinders, I used pencils and we drew the cow together in direct line sequential. Here, I found my original theory to be accurate. The legs looked like toothpicks and a few kids added way too many details. Not a bad thing mind you, just harder to paint. After the pencil drawing (and yes, many requests for an eraser), the kids traced over their pencil lines with a black crayon. I encouraged the kids to add clouds, a sun, flowers, large back spots, etc. The painting part was super fast. Set out large wash brushes and premix some blue and green watercolor paints. Easy peasy. So, the lesson in all this? Don't use pencils. I saved my best tip for last: If you're in a time crunch, use a cardboard template to trace for the cow's body. I set a couple of these per-cut templates on each table and gave the children the option of using them. Some kids turned up their noses at the extra help, while others dove right in. For teachers, it's really a quick way to get the project started and makes for a good sized cow. For more watercolor lesson ideas, check out Deep Space Sparkle's "Watercolor Projects" PDF booklet. I did this in the beginning of the year with 1st graders, and they looked SO GOOD! Teach Kids Art suggested at one point having kids draw with an eraser first and then pencil in the lines where the eraser marks are or wipe them away if they don't work right. I just found your blog and I love it. Thank you so much for sharing your wonderful lessons. I do love your site so many fantastic ideas that I have had great success with. Thank you! You are truly a great art teacher. The only thing I question is your use of templates as drawing aids. I can't help but think that would hinder a child's artistic growth. At some point they will need to have confidence to draw on their own. Personally, I love the charm of a kindergarden child's hand drawn image. I find that as long as you can get them to draw big it's usually successful and then they get to take complete ownership of their work. This is just my two cents. Perhaps there is another theory behind templates? 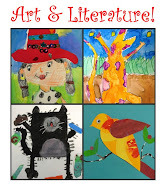 Most of my favorite art teaching blogs seem to use templates w/ their students? Regardless your art projects are incredible and still allow for so much creativity and exposure to various materials. It's refreshing to see an art teacher thats willing to take the time to expose kids to all mediums and create such a special blog for other art teachers. Thanks for your kind words, Anonymous! As for the use of templates, they are optional. I give alternate instructions and even the kids themselves can decide if they want to use them. Many don't. Sometimes, though, it's a great tool for art teachers. It steers kids away from frustration, it helps with time management and most of all, kids get a leg up on attacking a blank page! Either way, maintain your own art philosophies while teaching, incorporate new ideas when you can and enjoy. I did the cows with first graders last week, and everyone loved it! I planned to do it in honor of a all school dairy cow assembly, but unfortunately the cow got rained out! But it fit right in with the animal pattern unit I do with the first graders. I was going to hang some in the art room, but all of the first grade teachers loved them so much they wanted them in their classrooms! Thank you again! 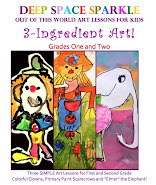 I just stumbled across you blog by doing a search for Kindergarten art projects. WOW!!! Thank you so much for sharing these wonderful ideas. We are a homeschooling family of a kindergartener. I can't wait to try these projects with her, she is going to be soooooo EXCITED!! She LOVES art! I look forward to seeing your future posts!